Have you checked out the Fluff and Fripperies facebook page lately? I'm running a little giveaway to help you AND YOUR BEST FRIEND stay ahead of the fash pack, by sporting this season’s hottest nail colour. Blue nails were a stealth trend throughout the summer but don’t worry if you’re just getting into the look, cos they ain’t going nowhere for Autumn Winter! Just last week Chanel launched their latest Limited Edition collection, Les Jeans de Chanel, featuring a light, mid-toned and dark blue (read about it on Fash Mob here), while YSL released the stunning polish, Black Indigo, as part of the True Blacks collection. Meanwhile in their latest nail polish trend book, New York Colour predicted shades of aqua, denim and teal as The Next Big Thing in nails! 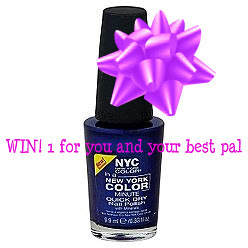 And I have 10 sets of NYC’s gorgeous navy shimmer, Pier 17, to give away for one lucky winner AND HER BEST FRIEND – so that’s 20 bottles in all. Instructions on how to enter are, surprise surprise, on the Facebook page here and the giveaway closes this Sunday, September 18th. Sorry if you’re not on Facebook, but there will be lots more lovely giveaways coming up -- they're addictive as it's wonderful to give back to everyone who reads the site. Here's a little hint about the next one! Make sure you've joined up through Google Friend Connect (hit the 'Join this site' button under the Facebook gizmo to the right hand side of this page) and follow on Twitter, too, so you’ll be the first to hear.